Bobi Wine enroute to Parliament to take oath as Kyaddondo East MP. Courtesy photo. KAMPALA. Robert Ssentamu Kyagulanyi also known as Bobi Wine has been sworn in as the newly elected Member of Parliament for the Kyaddondo East constituency. Bobi Wine was sworn in at exactly 2pm Tuesday afternoon. He was accompanied to the podium by Mukono Municipality MP Betty Namboze and other opposition MPs as well as independent members of the House. Kyagulanyi shortly received a congratulatory message from the Speaker of Parliament Rebecca Kadaga who later welcomed him to the Chambers the instruments of office that include the Constitution of the Republic of Uganda and the Rules of Procedure of Parliament. 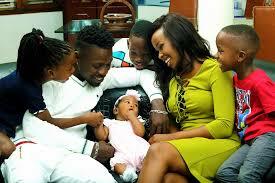 Bobi Wine shares a light moment with his family. He later sat down in the section where Independent MPs sit as several MPs struggled to shake his hand and welcome him to Parliament amid Speaker Kadaga’s calls to give him space. Clad in a grey suit and ray bans and accompanied by his wife Barbie Kyagulanyi who was clad in a red dress the couple arrived at Parliament at exactly 1pm on Tuesday afternoon amid cheers and ululations from fans and supporters. Bobi Wine was elected Kyaddondo East MP after both the High Court and the Court of Appeal annulled Apollo Kantinti’s victory arguing that the Electoral Commission did not conduct the election in a proper manner. He garnered 77 per cent of the votes beating his nearest rival Sitenda Ssebalu of the National Resistance Movement by a difference of more than 20,000 votes. While addressing supporters soon after his swearing in ceremony, Bobi Wine said his victory is a victory of the ghetto youths and other deprived youths throughout the country.